Since 1999 MMP have been applying their extensive knowledge of the construction trade to construction project management, providing a comprehensive project management service to clients in a diverse range of sectors.By providing customers with a single point of contact for more efficient management of projects MMP is able to create cohesive coordination between the teams involved in the project from design and construction to health and safety. From the project’s inception to its completion clear lines of communication are established and maintained enabling projects to be brought in on time and on budget. The core of Construction Project Management work begins before the project. Comprehensive planning in advance of the project minimises the amount of management required during the construction phase which helps to ensure the project meets its deadline. Surveying the site to discern where problems may arise is a critical component of this process. The project analysis will consider the type of site and how the particular features of that site may affect the running of the project. This requires experienced analysts who can quickly spot potential problems. Organizational elements also factor into the preparation at this stage such as the degree of occupation required on the site during the construction phase. By working with the design team project management can facilitate safe and efficient coordination of a “live” site. In MMP’s work with Westmeath County Council Offices this was a factor that had to be taken into consideration. The campus around the construction site would continue to be occupied during construction. Through careful planning we were able to minimise disruption to the normal operation of the campus while keeping workers and personnel safe and at the same time maintain the construction schedule. Less typical factors may also have to be taken into consideration in the project analysis phase such as archaeological conservation. 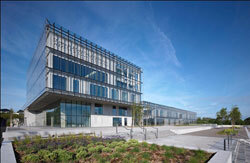 This was also the case on the Westmeath County Council Offices project. Through coordination with the design team the remains of an historic Gaol were kept safe from damage during construction. Not every project can occur under ideal conditions with adequate time for planning. Particularly in the challenging environment of today’s construction industry, projects may be at an advanced stage or even in a distressed state when construction project management is engaged. Managing projects in this way relies on the confidence and discipline that come from experience. The changeable nature of economies means that even in stable economic climates project managers deal with unexpected events such as liquidation of suppliers and contractors. This was one of the challenges faced by MMP in our work on Wexford County Council Offices. MMP were engaged with the project as Quantity Surveyors when the primary contractor went into liquidation. When MMP were appointed to the role of project management the site was rapidly secured and protection implemented for partially installed systems. MMP retained as many of the original sub-contractors as was possible allowing the building to be successfully completed. This prompt and competent construction project management resulted in a building that has subsequently won several national and international awards and is widely regarded as one of the country’s most successful local authority constructions. On many projects it is considered acceptable for project deadlines to slide as disruptions such as changes of brief and unforeseen circumstances occur. At MMP we do not consider that such delays are necessary. Comprehensive people management systems are an effective solution to the problem of sliding deadlines. Rather than accept schedules running over deadlines MMP look to rigorous time management and quality control with health and safety, design and project teams as well as contractors. For many projects, sliding deadlines are simply not acceptable. This was the case in MMP’s work on the Willow Park project. Temporary classrooms had to be constructed within three weeks in order to allow students to move out of the 25 classroom school that was to be demolished. Upon successful completion of the final construction students were able to move back into the new fully fitted out and refurbished classrooms for the April term. This also prevented additional costs of rental on the temporary facilities. MMP are capable of bringing a broad range of skills to the projects they manage. From careful project analysis through competent and dynamic handling of situations in flux to rigorous organisation and coordination of teams and schedules, MMP provide comprehensive project management services to all of their clients.